A Fun, Family-Friendly Event to Support Maui’s Healthy Lifestyle! 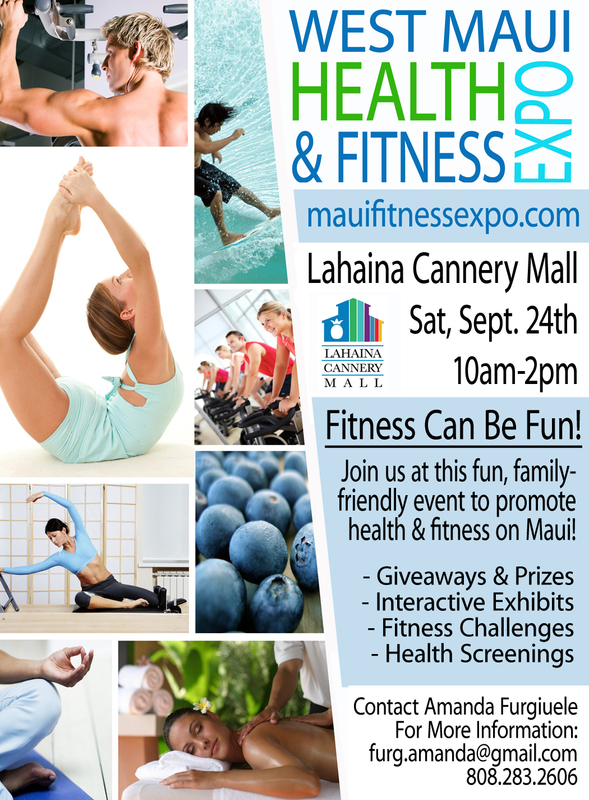 The 7th Annual West Maui Health & Fitness Expo! Aloha and welcome to the 7th Annual West Maui Health and Fitness Expo in conjunction with the Kidney Foundation! This premier event will showcase all the best of Maui’s health and fitness industry! Find a new class, try something new, make a goal and stick to it! We’re here to help! Plus, check out all the sales, specials, deals, and doings at each booth! This exciting event is the premier opportunity to showcase your business and connect with hundreds of qualified, eager, and interested clients from all over the island. Come develop brand recognition, acquire leads, increase your mailing list, and gain the competitive edge for your business at the West Maui Health and Fitness Expo! We’re planning an amazing day and an excellent advertising campaign designed to get the word out for you and your business! From e-mail blasts, to online newsletters, Twitter, Facebook, print, radio, flyers, and, of course plenty of word-of-mouth advertising, we’ve got you covered. The Lahaina Cannery Mall is Maui’s only fully enclosed, air-conditioned shopping destination and if you’ve ever been there on a Saturday, you know it can get busy! If you plan to attend and participate with a table/booth, we encourage you to contact us as soon as possible to register early. We have a limited number of tables available and we want you to be part of this remarkable day! If you have any questions please feel free to contact Amanda Furgiuele, the program producer, at info@mauifitnessexpo.com. Whether you choose to feature your unique business, make a donation for our raffle, or simply join our wellness celebration, we look forward to seeing you Saturday, September 24! Please mark your calendars and spread the word! This entry was tagged maui fitness expo. Bookmark the permalink.